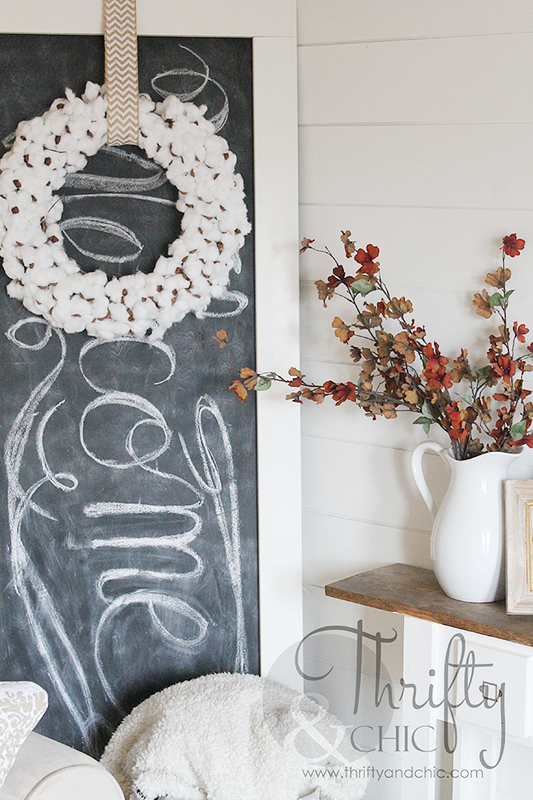 What you'll need is a grapevine wreath, some cotton and a couple of pine cones (the older the better). First step is to get your cotton ball, stretch it out a little long ways first, then sideways, then roll it into a ball. 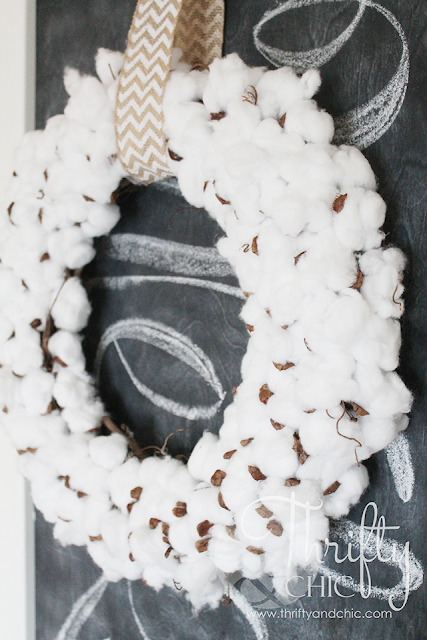 Grab some hot glue and put it on the wreath. Work your way around the wreath, inside and outside. Make some bigger, some smaller. Next get your pine cones and start taking off the little pieces. Twisting and pulling help a lot. If you can get some scissors in there, this will save you some headache :) The older ones seem to have a little more give than the newer ones. 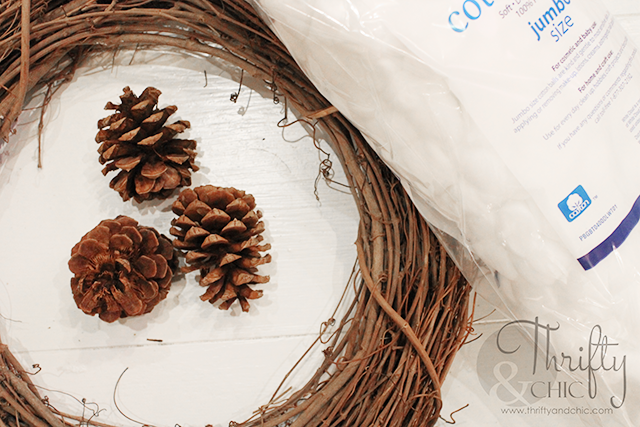 Now with the pine cone pieces, you want to glue them in between the cotton. Real cotton stems have their seeds coming up over the cotton on all sides. So, I tried to make mine look organically as possible, securing anywhere from one to three pieces onto any given cotton ball. There was really no rhyme or reason. Once I was done, I then did a look over and added more where it looked too empty. I let some of the grapevine stems peak out a bit too. For me, the cost of this wreath was about a buck. Just the cost of the cotton balls I had to buy. I bought a 400 count bag of cotton balls and probably used half. 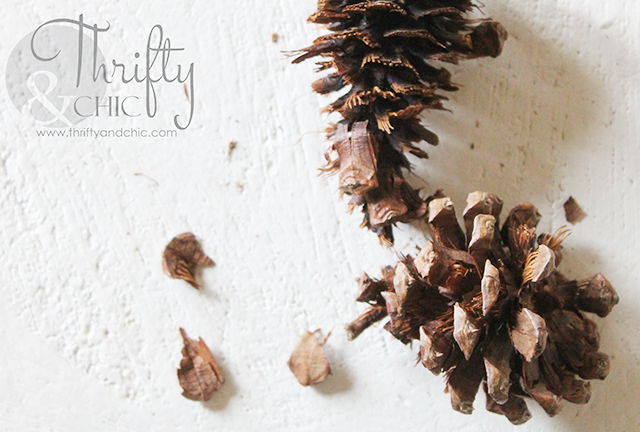 I used about 2 and half pine cones I had from several Christmases ago and an old wreath. See, a lot cheaper than buying real stems :) I'm sure I'll still buy some stems anyways to put in a vase. So, if you have a great place to get them, let me know! You know cottonwood trees are different from cotton plants, right? I kind of missed the cottonwoods this year (despite what Google calls me, I'm now Karen In South Jersey). Of course, I never lived directly downwind of any, so didn't have the accumulation. A friend had a willow positioned so its cotton (I didn't know they did that, but at least some do) blew right in her garage door, and hated it. This is so cute and seems really easy! I'd actually probably make mine with a little less "cotton" so you can see more of the wood underneath. This is really cute. 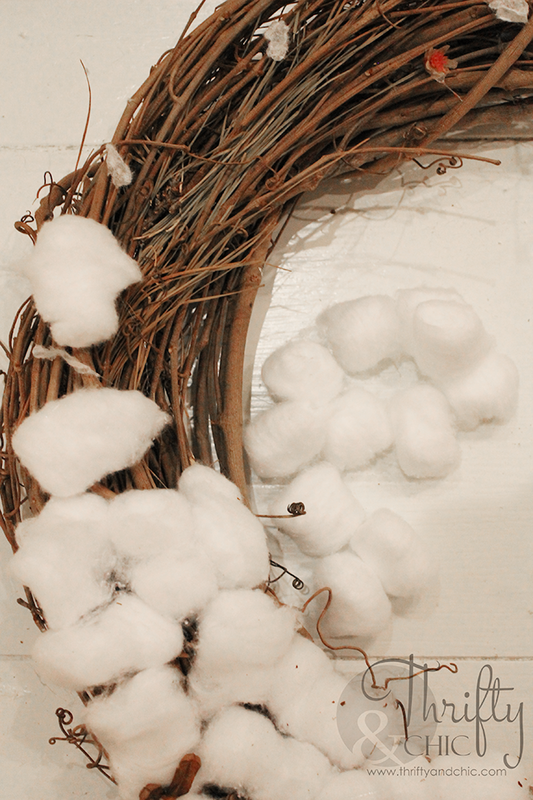 When I first saw the picture I assumed you used real cotton stems and figure it would be expensive. Why do I doubt you!? You're the thriftiest ever! AND the cleverest! LOVE IT.